Hey, do you remember the first time you plunged into a cold mountain stream and resurfaced, your breath shocked from you, your body quivering with the cold and the excitement of the water. If you’re like most New Zealanders, you’ll have a favourite river hidden not too far from home. Wild rivers on public conservation land are the stuff of legends. Explorers like Thomas Brunner made his epic journey along the forest clad Kawatiri/Buller in the mid 1840s. For 560 days he journeyed from Lake Rotoiti and returned, accompanied by his knowledgeable and capable guide Kehu. Along the way he dined on weka and blue duck – plentiful at the time! They also ate longfin eel and grayling – the latter now extinct. Maori used the mighty rivers as their pathways. The ancient pounamu trails between the east and west coast were well utilised trading routes for pounamu, ti (sugar from the cabbage tree), and other stores and weapons. 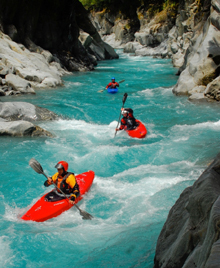 The Rangitata River was an adventurous route that took Maori up to O Tū Wharekai – the food baskets of the Hakatere Basin wetlands (now conservation park). Journeys along the Whanganui River have been celebrated, including with movies like the River Queen. These routes into the hinterland enabled Maori to both trade and meet with other hapu along the way. Travelling along these waterways showed great skill. A favourite journey of mine was down the Whanganui River in 2001, lead by local guide Rangi Bristol, with nightly rests at two marae along the way. The country is wet – every time we said ‘lunch’, the sky would say ‘rain’. The chocolate rich waters of the Whanganui were our home for 3 days. Only when we slipped up the quiet Manganui-o-te-Ao, did we see clear water. The Mokihinui River on the West Coast is named after a raft built by local iwi to escape a warring party. Mokihi meaning “raft –generally made of raupo”, and nui – “big”. The river was the pathway for the first route to the Karamea, a benched pack track up to the confluence with the aptly named Rough & Tumble – the 1929 earthquake destroying the safe bridge crossing and rendering the route to history. This mighty river, like many others, has become a target for hydro development or irrigation storage/extraction – the latest 3D craze: damming, diversion, and draining. With the combined threats of around 60 rivers (and growing) targeted for hydro development – and a ‘blue’ rush for water storage in the drought prone Canterbury Plains, we needed to get smarter than just tackling one river at a time. Hence a coalition of willing national NGOs was formed. Our Wild Rivers campaign kicked off last month amidst the publicity of Gerry Brownlee’s momentary lapse as he revealed that the Mokihinui scheme planned by Meridian is not needed for the security of our future energy needs. His statement shows that the National government have done some serious soul-searching in the face of mounting opposition to the loss of any more of our wild rivers. Clearly solutions are needed, but we do not need to pursue the futile and wasteful prospect of unlimited growth in a finite world. Comprising Forest & Bird, Fish & Game, Whitewater NZ, Federated Mountain Clubs, NZ Rafting Assn, Council of Outdoor Recreation Assns of NZ, Federation of Freshwater Anglers, Environment and Conservation Orgs of NZ, and Mountain Bike NZ, the coalition membership numbers in excess of 100,000. So take heed, take a camera (there’s a photo competition a well), take your Forest & Bird Wet and Wild special edition magazine, take a pack, kayak, or fishing rod – and head to your wild river. Hear its magic – and then get on board the campaign.